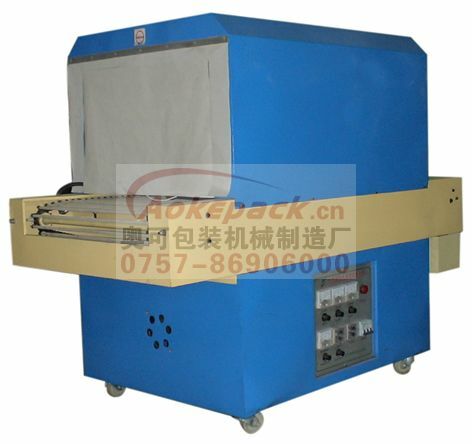 shrinkable packer is automatic successive shrinkable packaging device and is the latest pattern in our country, using quartz farness ultrared rays tube and electricity-saving (may save more than 15%); the humidity of shrinking and the conveying rate of the electric machine is adjusted, and the adjusting range is extensive; Original creation roller rotation devise and can work continuously. This machine is especially suited to shrinkable film packaging for its characteristics of advanced design, reliable function, well saving-energy effect, novelty and good-looking structure , the convenient operation and maintain, and so on. Electronic no-grade timing, automatic constant temperature, alternating current (AC) contactor controlling, direct spray cooling machine, hot air machine which can be adjusted 1-3 gear, and it is stabilization and reliable, long life and less noise. Be suited to hardware family property, outside furniture, light industry, food, drink, candy, schooling things, industrial arts, hardware tools, daily expenses general merchandise, chemical industry things, and so on. Improve the product exhibit and sell through packaging, and is damp-proof by sealing.